Sephra Chocolate: Great for Fountains and for Confections! Sephra’s chocolate fondue for chocolate fountains is known for its stellar quality and convenience – but did you know that our chocolate is preferred by confectioners? The delicious taste and quality make Sephra’s chocolate perfect for fountains and decadent chocolate delicacies! Why Confectioners Choose Sephra’s Chocolate for Chocolate Fountains? Sephra’s Belgian chocolate for chocolate fountains is prized for its distinct and rich European flavor because it’s imported from Belgium and made from Sephra’s proprietary recipes. The attention to quality translates into delicious, luxurious chocolate for both confectioners and chocolate fountains. In order to produce professional desserts and candies, confectioners require sumptuous chocolate ingredients that won’t lose flavor when baked or lose consistency and continually present a challenge to confectioners. Sephra’s chocolate, whether it’s our dark chocolate, milk chocolate or white chocolate, maintains its consistency and delicious flavor during baking or candy-making, translating into a beautiful and delicious dessert. The Versatility of Sephra’s Fondue Chocolate for Chocolate Fountains Sephra’s imported Belgian chocolate for chocolate fountain varieties help make transform recipes for confections and baked goods from tasty to mouth-watering. Peruse our chocolate recipes, which range from creative confections to chocolate staples, such as chocolate mousse which is taken to the next epicurean level with the addition of Sephra’s dark chocolate. Flourless orange chocolate cake takes Sephra’s milk chocolate and transforms it into a citrus chocolate delight. Sephra’s white chocolate helps make cookies n’ cream cheesecake rich and buttery. It also transforms a simple berry parfait into raspberry white chocolate parfait, a dessert worthy of kings. If you want to jazz up simple crepes, try adding Sephra’s white chocolate to indulge in white chocolate crepes.Sephra even offers a decadent recipe for chocolate-stuffed French toast and chocolate almond scones, perfect for a brunch. 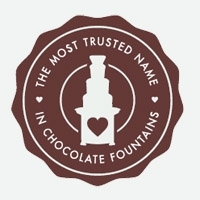 Don’t feel that Sephra’s chocolate is limited only for use in our chocolate fountains! Add Sephra’s chocolate into your favorite brownie recipe or try Sephra’s chocolate peanut butter stud muffin minis. You’ll soon discover that Sephra’s chocolate will transform the simplest recipe into a treat worth sharing.